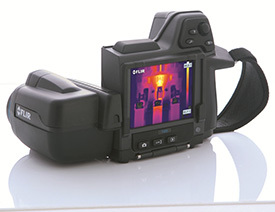 Infrared thermography is a non-destructive technique for detecting temperature differentials that may indicate problems such as loose electrical connections or excessive friction in machinery and mechanical systems. A camera-like device views a large area at a time, senses infrared emissions and converts the emissions into a visual display. The equipment remains in operation, so production is not interrupted. “Hot spots” can be pinpointed quickly, saving labour and cost, and targeting plant maintenance where it is needed. Electrical— using infrared thermography a technician can help detect faulty connections in early stages, so possible breakdowns can be avoided. Mechanical— excessive friction can cause breakdowns if equipment is not lubricated properly. Infrared thermography can help detect problem areas in motor bearings, gears, couplings, pulleys, conveyors and chain drive systems. Refractory/Insulation — this application addresses hidden losses of heat that can drain performance and increases costs. Experienced thermographers can evaluate thermal images of walls, ceilings and roofs for signs of heat either escaping from those areas or entering the insulated space. Thermoscan only employs qualified electricians with Level 1 or 2 Thermography qualifications.